A 1×5 strip of 0.1″ header pins and a 1×5 strip of 0.1″ right-angle header pins are included, as shown in the picture below. You can solder the header strip of your choice to the board for use with custom cables or solderless breadboards or solder wires directly to the board itself for more compact installations. The board features two mounting holes that work with #2 or M2screws (not included). The data ready and interrupt pins of the LPS331AP, L3GD20, and LSM303DLHC are not accessible on the AltIMU-10; if you need these outputs, consider using ourLPS331AP carrier, L3GD20 carrier, and LSM303DLHC carrier boards. 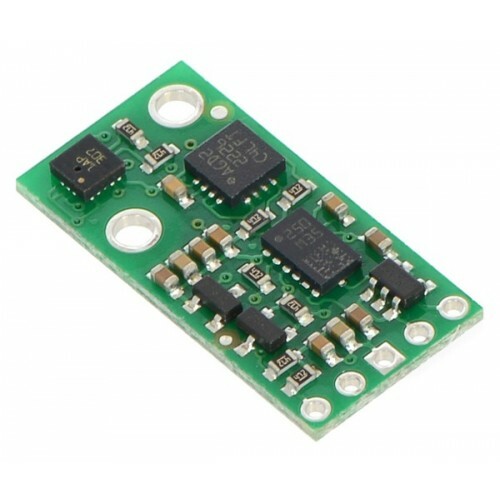 The LPS331AP’s barometer, the L3GD20’s gyro, and the LSM303DLHC’s accelerometer and magnetometer can be queried and configured through the I²C bus. Each of the four sensors acts as a slave device on the same I²C bus (i.e. their clock and data lines are tied together to ease communication). Additionally, level shifters on the I²C clock (SCL) and data lines (SDA) enable I²C communication with microcontrollers operating at the same voltage as VIN (2.5 V to 5.5 V). A detailed explanation of the protocols used by each device can be found in theLPS331AP datasheet (453k pdf), the L3GD20 datasheet (2MB pdf), and the LSM303DLHC datasheet (629k pdf). More detailed information about I²C in general can be found in NXP’s I²C-bus specification (371k pdf). We have written a basic LPS331 Arduino library, L3GD20 Arduino library, and LSM303 Arduino library that make it easy to interface the AltIMU-10 with an Arduino. They also make it simple to configure the sensors and read the raw pressure, gyro, accelerometer, and magnetometer data.